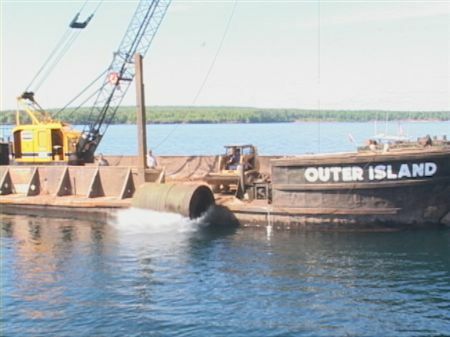 On June 8, 2001, the steam boiler was returned back to the shipwreck, Pretoria, near Outer Island in the Apostle Islands. 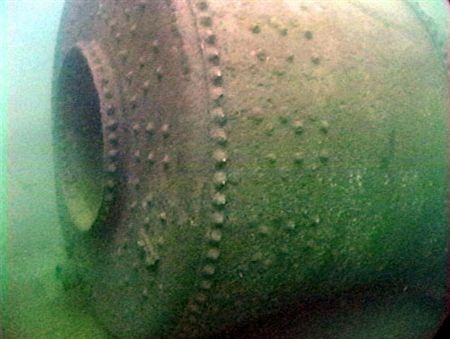 This was accomplished through the efforts of many people, most notably the Erickson Family of Bayfield, Wisconsin, the State Historical Society of Wisconsin, and the Great Lakes Shipwreck Preservation Society. The Pretoria was a 338-ft wooden schooner-barge, loaded with iron ore, that sank on September 2, 1905 a mile off the lighthouse on Outer Island. It was in tow with another ship, the steamer Venezuela, when a violent storm disabled the Pretoria's steering gear and the tow line parted. Captain Smart and his crew scrambled to the life boat, but only five of the crew of ten made it safely to shore. This is a unique situation. Back in the late 50s, Ed Erickson salvaged various parts and cargo off the Pretoria, including the main boiler. On Friday, Robbie Erickson, Ed's grandson, skillfully maneuvered the Outer Island (a WWII landing craft, but that's another story) over the wreck and dropped the boiler and a mooring block into the wreckage field. Then divers went down and secured a cable and mooring buoy to the mooring block. Last summer, Pat Labadie, former director of the Canal Park Museum, and several GLSPS divers convinced Ed to return the boiler to the wreck, where it would add to the historical significance of the shipwreck. Before Ed passed away in March of 2001, he agreed to help return it. 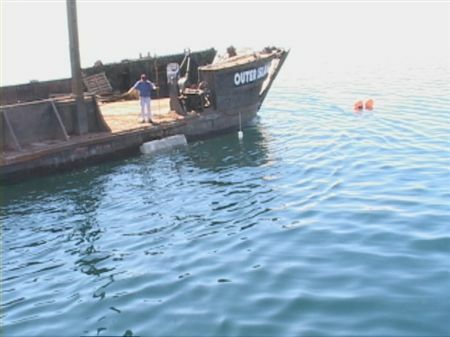 Jeff Gray and his crew from the State Underwater Historical Society spent a day marking the wreck for this operation. Early on June 8, Robbie and his crew from the Outer Island, along with several boats of divers, dropped the boiler onto the wreck site. The mooring buoy will allow divers to easily locate and anchor over the wreck without damaging the shipwreck. The copper identification plate from the boiler is in the Bayfield Maritime Museum. The museum has many fascinating artifacts showing shipwrecks and the unique way of life, when one lives near one of the largest fresh-water lakes in the world. A special thanks to the Erickson family, Ken Dobson of SER Inc, Jeff Gray and his crew, Bob Olson and his crew from GLSPS, The National Park Service, The Wisconsin DNR, The Great Lakes Shipwreck Research Foundation, and many others that helped in this endeavor. All above-water photographs by Jim Reagan; all underwater photographs by Bruce Bowers. Boiler is lowered into the water. Boiler is back with the Pretoria. Jeff Gray (left) and Bob Olson. Mooring block is lowered into the water. Divers attach mooring line to block. 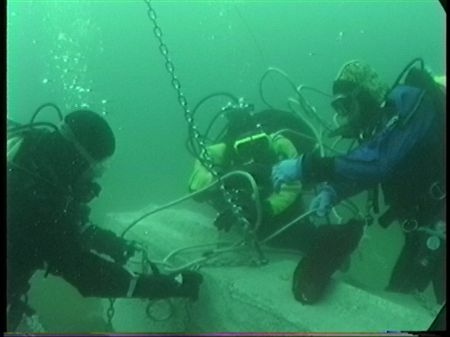 Another view of divers working on the mooring block. PLEASE NOTE: Project information about this project will be available as time permitts. We are sorry, the scouting and initial project are restricted to only a few people / members. Because of the diving level required to participate, (level 6 & TT) the participants are selected by experience and research knowledge of the Pretoria shipwreck. Extensive research has been underway for more than a year. Only the people that have participated in the lengthy meetings associated with the research and planning process are able to participate on these two projects. The detailed description of what the project process will be added as content to this event page after the scouting project. Please check back later after June 20, 2016. The project has been in the works for about a year. What the project is about is that in the early 2000's the boiler was returned as a Put It Back (PIB) Project. Mother nature has seen it in her heart to move the boiler 200 plus yards away from the actual shipwreck from storms and ice heaves. The GLSPS in joint collaboration with the Wisconsin Historical Society are working together to move the boiler back to be within a closer vicinity of the wreck for divers to view. Then secure it to prevent from further issues with it being relocated by unforeseen forces of nature. The first project was a scouting trip to locate and mark for the relocation project in August 2016. Further information will be presented on this report as we continue and complete the project. For further information about the project, please contact Jack Decker, Tim Pranke Ken Knutson or Phil Kerber. The first project was about locating the Boiler, marking it on the GPS Chart Plotter. The second part of the scouting project was identifying the location we will be moving the boiler to. The boiler was located and marked. Several dives on the Pretoria shipwreck had to be performed to determine where the best place for it to sit. This was determined by that facts that we didn't want it to ever move 300 feet from the shipwreck again. After two or three dives, we found a suitable location that would help secure it from the elements. We found a crevice that would facilitate the boiler and help it stay where we put it, then mark that position on the chart plotter as "Point 0". After all the above tasks were completed, we cruised back to our port of call, Silver Bay Marina. The next project which would be August 12 - 15, 2016 will be the project that we will actually lift the boiler and move in 300 feet to "Point 0" or 252 on the chart plotter. The GLSPS would like to thank everyone that participated in the Pretoria Boiler Securement Project last weekend August 12 - 15. A special thank you to Tim P, Jack D, for researching the boiler project for the last year (or more). Their hard work and dedication in preparing for this project paid off and allowed this project to be a success. The project had a few challenges with both the weather and the equipment but, at the end of the day, the boiler was placed very close to what we referred to as "Point 0" or 252 on the GPS Chart Plotter. The project started out with leaving Silver Ba just after 12:00 midnight and cruising across Lake Superior to the Apostle Islands in 5 to 6 foot seas with an occasional 7 ft wave during the early morning. The winds continued the next three mornings causing delays in the project. However, the winds died down in the afternoon each day and in the end, we prevailed. Without the hard work and dedication of the hand picked crew, I am certain the project would have not been completed and the success it was. Even though we completed the lift, we still have another project in the future securing the boiler to the bottom of the lake. This project will be much easier than the first stage of this project. Perhaps we can enjoy the Island more after stage two is completed. I predict that it should only take one day to drill two or three holes. This only comes from experience from past projects of the GLSPS drilling into granite rock. The rock we will be drilling into to secure the boiler is not as hard as the granite we are used to. So, it should take less time. Another project on this wreck site would be to locate the fire door of the boiler. We believe it was attached to the boiler when the boiler was put back into the water. We also would like to thank all of the participants for taking extra days off work to participate in this project. It's quite a sacrifice to do this for the GLSPS. Ultimately, we perform this kind of service in the name of preserving maritime history. 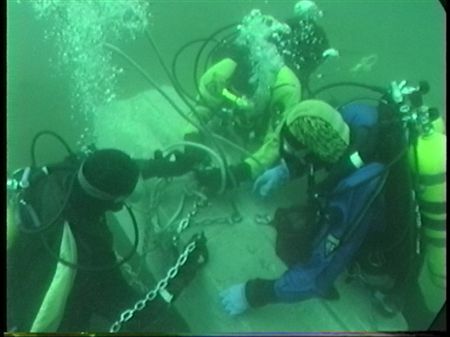 This year, the GLSPS once again sponsored a Project in the Apostle Islands to support the Wisconsin Historical Society in keeping the Pretoria Shipwreck's Boiler near its wreckage. Selected active members of the GLSPS cruised the RV Preservation research vessel from Silver Bay Marina to Outer Island of the Apostle Islands. This was a continued project from 2016 when the GLSPS lifted and moved the boiler 300 feet back to the shipwreck. This year 2017, we needed to secure the boiler. 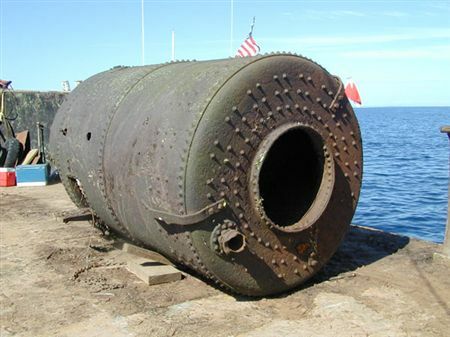 The boiler was attached to the bottom of the lake or near by the Pretoria Shipwreck by drilling eight holes into the bottom of the lake which is sandstone. We then used pinch bolts and epoxy to attached four 1/4 inch thick plates with two holes in each. We then attached a chain to each bolted-in plate and attached it to the boiler. This will provide four attachment points to the boiler to help prevent the boiler from moving around in the future. Both the 2016 and 2017 Projects were intense projects and many hours of planning for this type of underwater construction project. Many hours and days were spent to locate equipment, design and build the underwater parts to secure the very large and heavy object. The Pretoria Project was a very hard project for the GLSPS and Participants and we thank them for all their hard work, especially Tim Pranke and Jack Decker, which shared the Project Leaders position. Without their support and commitment to the project, it would not have taken place or be as successful as it was. 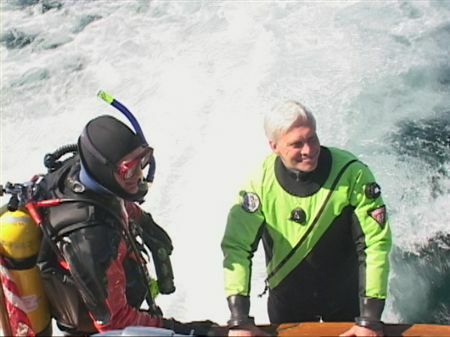 A special thanks goes out to both Jay Hanson and Phil Kerber for their use for the commercial dive equipment and rigging. Ken Knutson for his expertise and on-board consulting on underwater construction and rigging advice. The project was a success! We still have a few things to do on the wreck and are planning another 2018 Pretoria Project. Please check back to see what is next. We will be opening the project up to other GLSPS Members. Please check the 2018 Project Schedule for more details and registration requirements.